Why do you call Jesus the Son of God? Jesus-Islam » Jesus Christ » Why do you call Jesus the Son of God? What do we mean by a son? God does not have children, and He was never begotten or born, so how can Jesus be his son? Let us think for a moment of the use we make of the word “son” (ابن). One day I asked a friend his country of origin. He replied: “I am a son of Morocco”. Did he want to tell me that Morocco married a woman to give birth? Absolutely not ! He simply wanted to let me know that he was Moroccan from head to toe and that he bore all the characteristic features of a true Moroccan. Similarly, when the Bible says that Jesus is the Son of God, it means that he possesses all the characteristics of God. However, in the case of Jesus as the Son of God the meaning is much deeper. Those who read and speak Arabic can easily understand this notion: فلان عربي ابن عرب, (which means: this man is an Arab-born Arab). It is spoken in this form to emphasise the pure Arabic origin of the person, and to highlight the fact that he is really an Arab. In the Bible, the apostle Paul shows us how a Jewish person would emphasise his own racial purity. He says that he was a Hebrew of the Hebrews. However, those who are emphasising their purity as Arabs or Moroccans have this way of phrasing it—they are sons of Morocco, truly, purely and solely Moroccan. So when the Bible says that Jesus is the Son of God, it simply wants to say that he is truly God. We also say, always in Arabic: فلان ابن عشر سنوات (literally: this child is the son of 10 years), to say that he is 10 years old (or equal to 10 years). In the same way, the expression Son of God, applied to Jesus, means that he is equal to God in nature and in essence. Therefore, when it is said that Jesus is the Son of God, it must not be understood in a genetic and natural sense. This does not mean that God married Mary to give birth to Jesus. To say or even think such a thing is a blasphemy. Jesus was conceived by virtue of the power of God himself, not by any human or physical intervention. Our problem in understanding sonship is that we begin with what we know and experience and try to apply it to God. Instead we should see earthly sonship as a finite and physical reflection of something in creation that is meant to teach us of something infinitely superior in God. Jesus is the eternal Son of God, not a child of some physical relationship God had with Mary. Before ever Jesus became Man, He was the eternal Son of God. 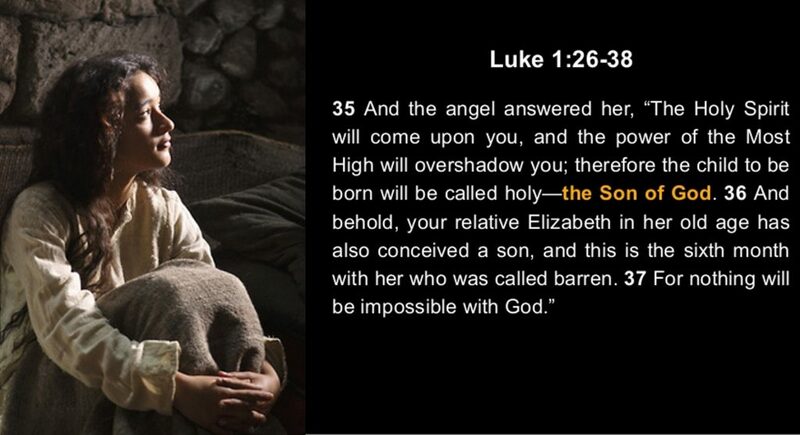 The prophets before the birth of Jesus agree. One wrote, “Unto us a child is born. Unto us a Son is given., and his name shall be called, Wonderful, Counsellor, Mighty God, everlasting Father.” (Isaiah 9:6-7) Time and again the former prophets spoke of the promised Messiah as existing eternally before He became Man. Thirty years after the angel’s visit to Mary, in which he spoke of the miraculous conception of Jesus, during his earthly ministry, Jesus said to a man, “Do you believe in the Son of God? The man answered, “Who is he that I believe in him? And Jesus said to him, “You have seen him and he who speaks to you is he” (Injil, John 9: 35-37).